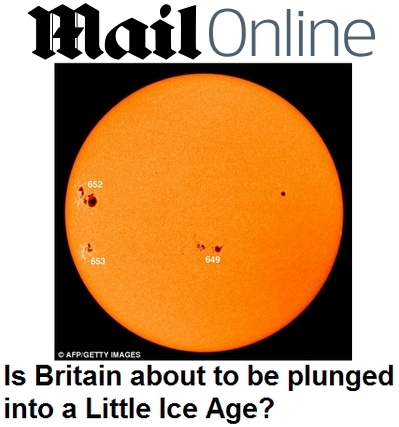 Is Britain about to be plunged into a Little Ice Age? Scientists think Britain and Europe could be in for a chilly few years predicting a 'Little Ice Age' could be on its way in just a few decades time. Average temperatures in Britain could fall by two degrees centigrade, according to the study led by Mike Lockwood, professor of space environment physics at Reading University, because of a drop in the amount of sunspot activity. Sunspots are darker patches seen in the sun's surface which are caused by small areas of magnetic activity which disrupts the normal flow of intensely heated gases. CLIMATE: WE ARE likely to experience several years of colder winters with more frequent cold spells similar to the current conditions, according to a UK climate expert. The change comes as a result of a link between the sun and the high altitude jet stream winds, explained Prof Mike Lockwood of the department of meteorology at the University of Reading. 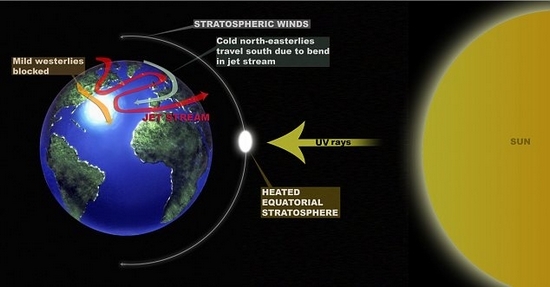 He and colleagues have established a link between low solar activity and a phenomenon known as “jet stream blocking”. It causes a change in the normal weather patterns, keeping warmer Atlantic air away and instead channelling frigid Arctic and Siberian air across western Europe, including Ireland, he said. Solar activity in this case does not mean heat or light from the sun but the energy emitted from the solar surface by sunspots. Millions are suffering and thousands have died from flooding in Pakistan and China. An extraordinary heat wave in Russia sparked fires causing dreadful pollution and wiping out swathes of the wheat crop. Are these weather-related disasters caused by global warming? Do they portend to worse catastrophes? What can be done? Should Pakistan get more aid? In its most recent report, the U.N.’s Intergovernmental Panel on Climate Change, or IPCC, asserts that as the world becomes warmer, “flood magnitude and frequency are likely to increase in most regions.” This seems plausible: a warmer world is also likely to be a wetter world, as more water evaporates from the oceans into the atmosphere. But, although rainstorms last week put out some of the fires, Russia has a drought. The IPCC also claims that droughts, too, are more likely in a warmer world – and that they have become more frequent since the 1970s, partly because of reduced precipitation. In fact the number of droughts reached a low point between the mid-1970s and the mid-1980s: The evidence shows there has been no statistically significant increase in droughts since the 1950s. Given that global temperatures appear to have risen considerably since then, it seems a stretch to blame the Russian drought on global warming. Asking the somewhat obvious question, “are cold winters in Europe associated with low solar activity?” a group of scientists have announced that the answer is yes. While this may seem unsurprising, the finding is another indication that Earth's climate is not simply driven by greenhouse gas emissions. Even so, some scientists are only grudgingly accepting the finding, cautioning that this only applies in the central UK and refusing to admit that the Sun could affect global mean temperatures as well. Still, the researchers found that average solar activity has declined rapidly since 1985 and cosmogenic isotopes suggest a possible return to Maunder minimum conditions within the next 50 years. This could be a sign that climate science is starting to recover from its CO2 fixation. Lower winter temperatures were common in Europe during the second half of the 17th century, famously allowing frost fairs to be held on the Thames in London before riverine developments increased the flow rate. These cold winters coincided with the Maunder minimum in solar activity when the Sun remained virtually free of sunspots for almost 50 years. However, establishing that this was not just a chance occurrence requires that the relationship continue to hold over a long interval, such that cold European winters become less frequent when solar activity is high and then more common again when solar activity falls. Various indicators show that during the recent minimum of the 11 year sunspot cycle, the Sun has been quieter than at any time in the previous 90 years. This yields an opportunity for a better test of the relationship between solar activity and cold European winters. To do this, we require two long and homogeneous time series: one which quantifies solar outputs relevant to seasonal/regional climate and the other relevant to European winter temperatures. 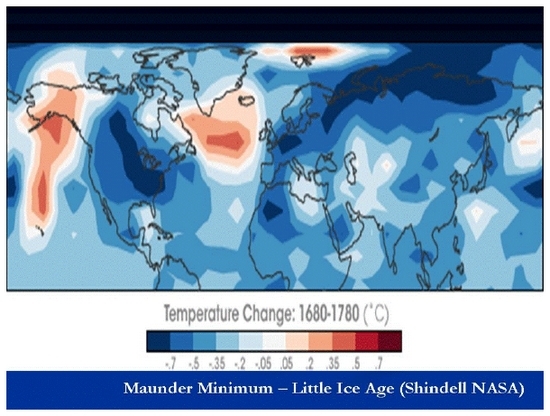 We here use the Central England temperature (CET) data set which is the world's longest instrumental record of temperature and extends back to 1659, at the start of the Maunder minimum. Horse racing on frozen rivers? Ice bowling? Activities last seen during Britain's Little Ice Age could once more be seen, researchers believe. Having just emerged from a bitterly cold winter the experts are warning that Britain could return to the mini ice-age at the end of the 17th century. This is despite claims that global warming is causing Arctic ice to melt and temperatures to rise. Back then the Thames played host to 'frost fairs' complete with puppet shows, horse races and ice bowling. Henry VIII is even said to have travelled all the way from central London to Greenwich by sleigh. The prediction of a return to an annual deep freeze follows research linking solar flares and other activity on the surface of the Sun with the weather across northern Europe. 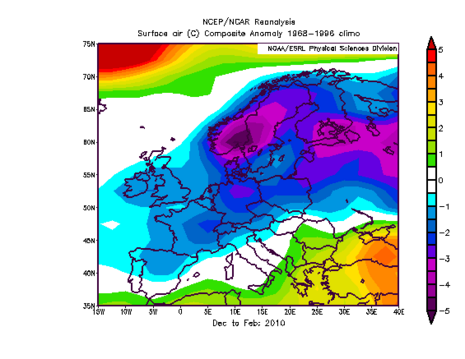 Will Colder Winters become more Frequent over Northern Europe? Researchers from the University of Reading (UK) have found a link between the colder winters of northern Europe and low solar activity. The report describes how we are entering into an era of lower solar activity which is likely to result in UK winter temperatures more like those seen at the end of the seventeenth century, which was very cold. A look at the 2009-2010 winter temperature anomalies over Europe (NOAA). The researchers suggest that the anomaly in Northern Europe's winter temperatures could be to do with a phenomenon called 'blocking', according to the EurekAlert release. A link between low solar activity and jet streams over the Atlantic could explain why, despite global warming trends, people in regions North East of the Atlantic Ocean might need to brace themselves for more frequent cold winters in years to come. A new report published in IOP Publishing's Environmental Research Letters describes how we are moving into an era of lower solar activity which is likely to result in UK winter temperatures more like those seen at the end of the seventeenth century. Lead author Mike Lockwood of the University of Reading said: "This year's winter in the UK has been the 14th coldest in the last 160 years and yet the global average temperature for the same period has been the 5th highest. We have discovered that this kind of anomaly is significantly more common when solar activity is low." The new paper, 'Are cold winters in Europe associated with low solar activity? 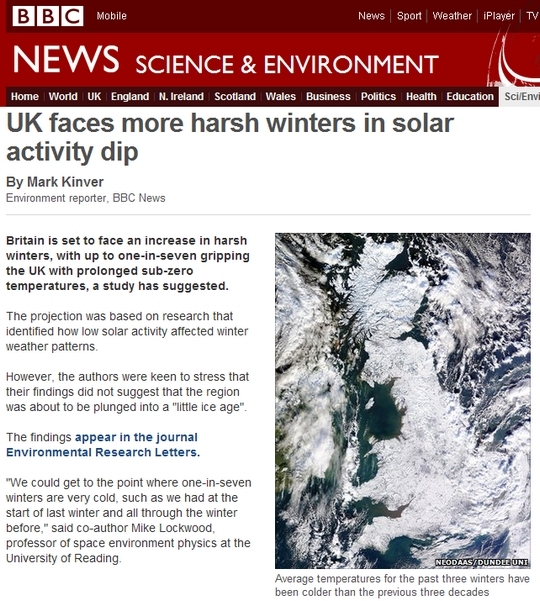 ', differs from previous efforts to explain the UK's recent cold winters by comparing the most comprehensive, but regionally specific, temperature dataset available (the Central England Temperature dataset) to the long-term behaviour of the Sun's magnetic field, and to trends across the entire Northern Hemisphere.